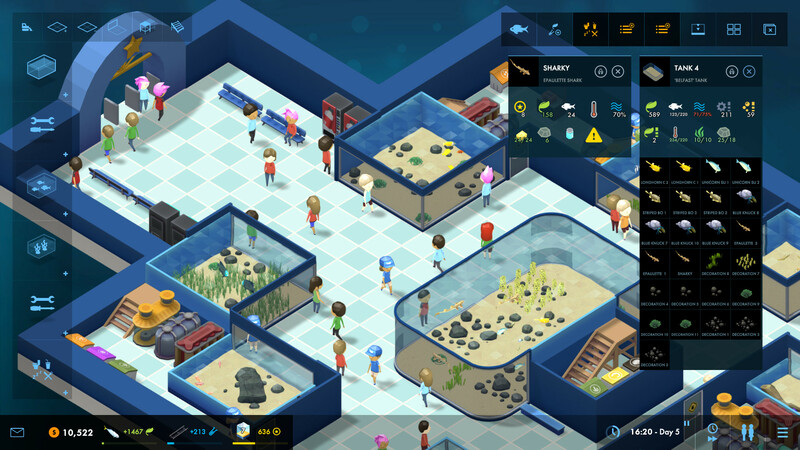 Megaquarium is another one of many economical simulators, but here you will not manage a city or a company, but a thematic marine amusement park, a huge aquarium park. Create your own personal amusement park on the marine theme, get as many different types of fish as possible, arrange a tour of the park and show the virtual inhabitants how huge the water world of our universe is. Starting with just a few animals and a large exhibition hall, you will be able to gradually develop your park to incredible sizes, building new rooms, equipping them at your discretion, populating aquariums with new kinds of fish and sea creatures. What really strikes you is the seriousness of the developers' approach to the range of content. You will find more than a hundred species of different marine life, from fish to microorganisms, from ordinary mammals to predators, from the appearance of which the blood in the veins freezes. In this case, you decide what kind and type of fish to please their visitors. You will create each room manually. 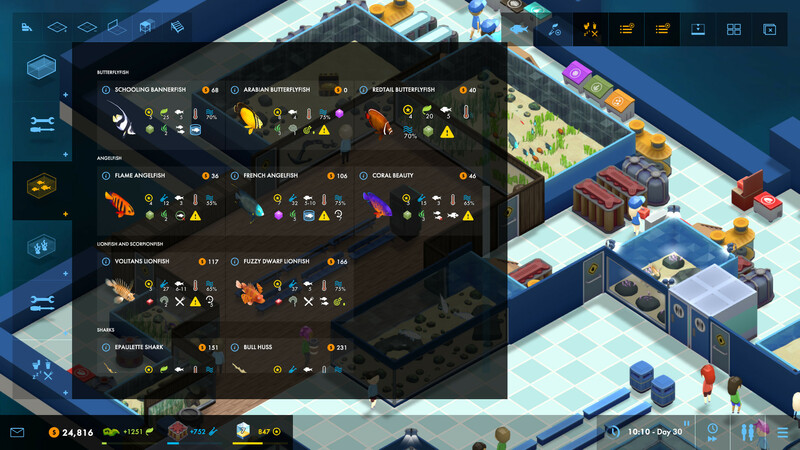 You will have the widest arsenal of tools with which you will build aquariums, fill them with everything you need, buy equipment and various accessories, and create an environment in which visitors to your park will be satisfied with everything without exception. Naturally, your goal is to develop the park and increase earnings. But after all, earnings depend not only on the number of exhibits, but also on a huge number of other factors. You will have to deal with staff recruitment, hiring new employees, cleaning and monitoring the work of specialists, and many others. Do not forget about the comfort of visitors. Do you think your visitors can do without a toilet or a restaurant? Believe, you are mistaken. This game has been updated 15-04-2019, 16:10 to the latest version v1.3.5g. Added rebindable hotkeys for all the buttons in the top left. Rebalanced plant/rock/cave lover requirements. Some are also worth extra prestige. 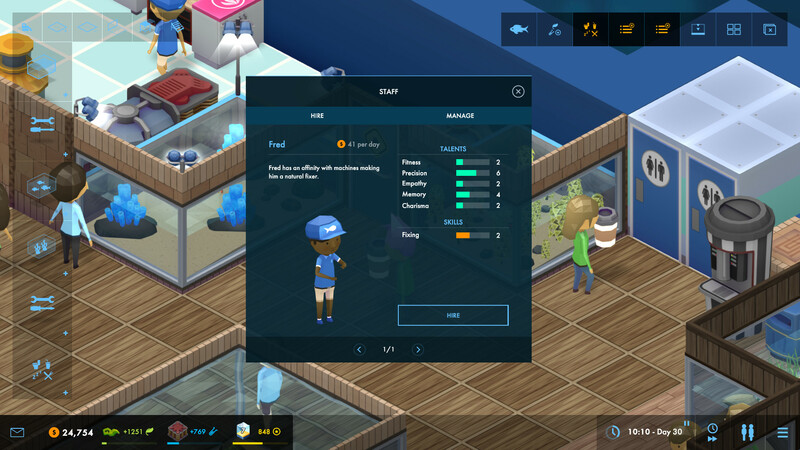 Added info panels for any animal given to the player as a gift in the campaign so you can see what its needs are before picking it up. Added difficulty to save game info. Switched to proper fullscreen borderless window mode. If you click on your other monitor it won't minimise the game. Fixed animation speed going faster than simulation. Optimised build menu so that it loads quicker. Optimised animations in general for better FPS in large aquariums, especially on low detail mode. Redesigned point bubble system to increase performance. Optimised objective checking to increase performance. Zoning interface now scales/wraps when it gets to full. Slightly increased opacity of build menu UI. Added feeding skill requirement to Blue Spotted Ribbontail Ray. Striped boxfish no longer eats starfish. Danger to tooltip now says "Starfish with size x or less". Fixed bug where tank counts were calculated incorrectly. Slightly increased size of tooltip text and width.